There are a flurry of weather apps for the iPhone and iPad. But the problem is that most these apps require you to keep checking them for updates. Dark Sky, on the other hand, comes to you. How so? Dark Sky’s killer feature is alerting you when it is going to rain or snow. And it’s quite accurate. Last night the app alerted me with a push notification that it would rain lightly in 25 minutes and last for 14 minutes after that. And sure enough, it did. Dark Sky will constantly update with your current location too. With these notifications, you never even need to open the app. When you do open it though, Dark Sky shows you the daily forecast including temperature highs and lows along with the precipitation forecast. Additionally, Dark Sky now includes a built-in weather widget to show you a one-line summary of the current conditions along with a next hour projection. It’s a simple widget but an effective one. 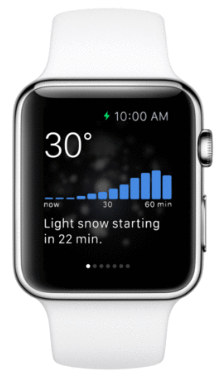 If you have an Apple Watch Dark Sky not only sends you the famous “rain/snow starting soon” notifications, but is a full featured weather app. This includes viewing of current and future conditions. The app looks beautiful! Dark Sky is just one of our favorite weather apps for iPhone and iPad. We’ve collected all of our favorites here. And if you’d like to see more of our top app selections in different categories, just head on over to our Best Apps Series.